Review: 2012-04-14, good fight even though there was no struggle on the ground: three stars for Alexander Gustafsson vs Thiago Silva. Alexander Gustafsson (13-1-0) entered as the No.11 light heavyweight in the world while Thiago Silva (14-2-0) entered as the No.17. 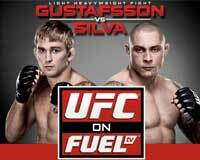 Gustafsson vs Silva is the main event of “UFC on Fuel TV 2”. Watch the video!